Lion dance 舞狮; 舞獅 is a form of traditional dance in Chinese culture, in which performers mimic a lion's movements in a lion costume. To start... You will need a lion head! 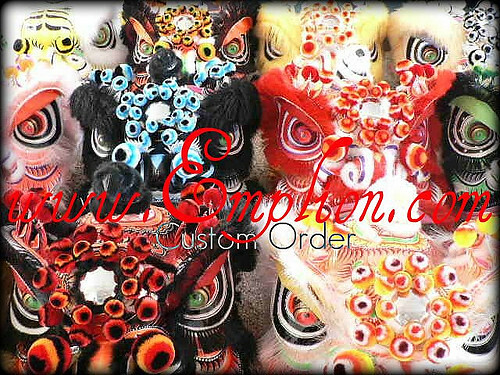 Emplion custom lion dance costume for customers. 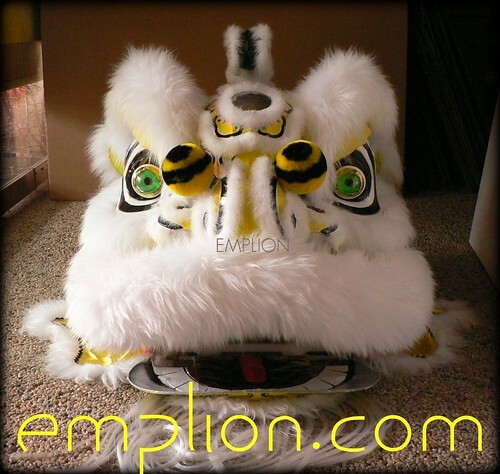 If you have any request or have seen any lion in our website which you would like us to make. Send us a custom order and we will create a piece of art for you! Please fill these 8 specs for your lion. 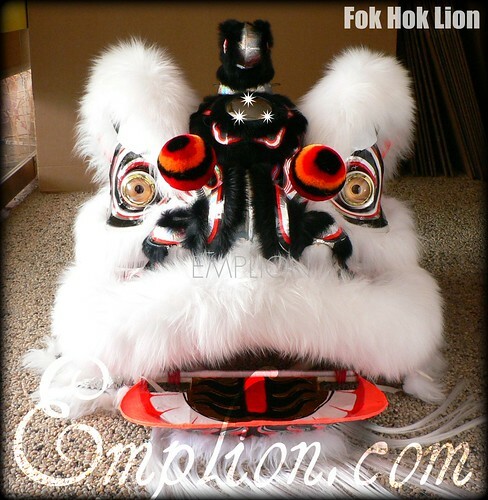 1) Custom Futsan, Hoksan or Fok Hok Lion? 3) Color of sheep's fur? eg: white, black, red, gold, pink fur. 4) Color of laser sticker or painted head? eg: silver, gold, red. 5) Color of flame design on the head? eg: red, gold, yellow flames. 6) Color and material of Lion's body? eg: sequin, satin, velvet body. 7) Date needed for the custom lion? Within your choice of 3,6,12 months. 8) Other special request for your custom order... eg: LEDs halo mirror and eyes. Custom Lion Price and Ready Time. 1) 6 to 12 Months Ready. US$650 Lion. 2) 3 to 6 Months Ready. US$790 Lion. Ready within 6 months. 3) 2 to 3 Months Ready. US$890 Lion. (Priority Service) For urgent customers. 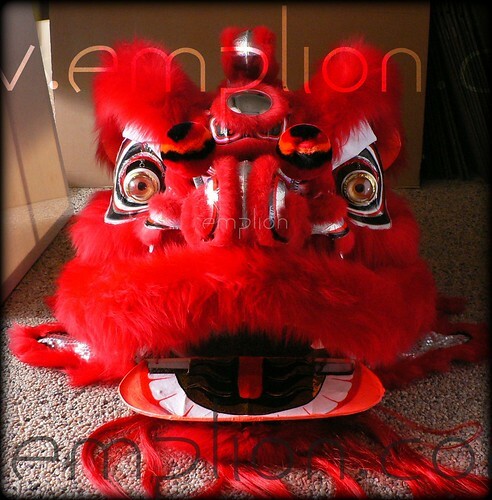 The lion dance originated in China close to a thousand years ago. Lion dances can be broadly categorised into two styles, Northern (北獅) and Southern (南獅). Northern dance was used as entertainment for the imperial court. The northern lion is usually red, orange, and yellow (sometimes with green fur for the female lion), shaggy in appearance, with a golden head. The northern dance is acrobatic and is mainly performed as entertainment. Sometimes, they perform dangerous stunts. Canton is the homeland of the southern style. The southern horned lions are believed to be Nians. The Cantonese style can be further divided into Fat Shan (Buddha Mountain), Hok Shan (Crane Mountain), Fat-Hok (minor style that exhibits a hybrid of Fat Shan and Hok Shan), Chau Ka (minor style performed by practitioners of Chau family style kung fu), and the Green Lion (Qing1 Shi1 - popular with the Fukien/Hokkien and Taiwanese). Fat San is the style many Kung Fu schools adopt. It requires powerful moves and strength in stance. The lion becomes the representation of the Kung Fu school and only the most advance students are allowed to perform. The Hok San style is more commonly known as a contemporary style. 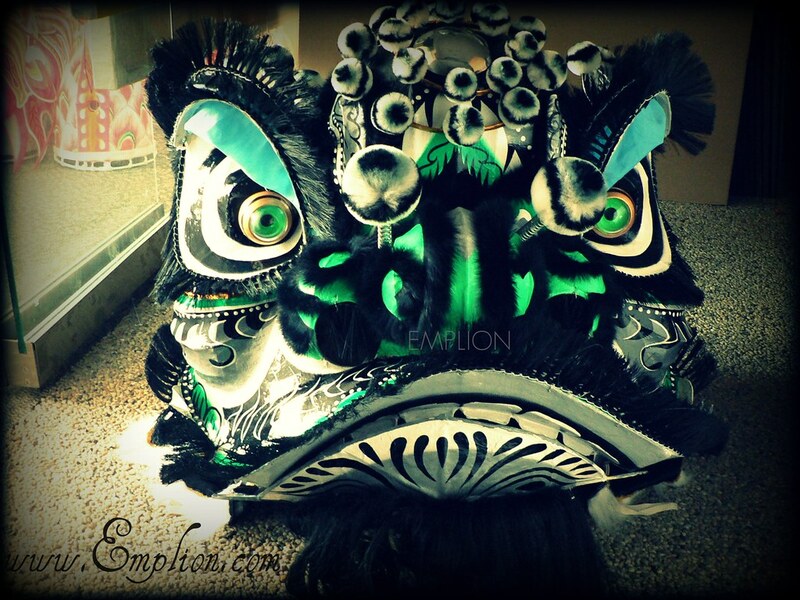 Contemporary Hok Shan style combines a southern lion head with Northern lion movements. Hok Shan style tries to reproduce a more life-like look, realistic movements, and acrobatic stunts. Its shorter tail is also a favorite among the troupes that do pole (jong) jumping.There is three important and the first colors of the lions. The lion with the white colored fur is considered to be the oldest of the lions. The lion with the goldish yellowish fur is the considered to be the middle child. Not the youngest or the oldest. And the black colored lion is considered to be the youngest lion so when people use this colour lion it should move fast and quick like a young child. Three other famous lion types can also be identified: Liu Bei, Guan Gong and Zhang Fei. They represent historic characters in China that were recorded in the classic,Romance of the Three Kingdoms. These three were blood oath brothers that swore to restore the Han dynasty. The Liu Bei (Cantonese: Lau Pei) lion is the eldest of the three brothers and has a yellow (actually imperial yellow as he became the first emperor of the Shu-Han Kingdom) based face with white beard and fur (to denote his wisdom). It sports a multi colored tail which encompasses the colors of the five elements, as it was believed that being the Emperor, he had the blessings of the heavens and thus control of the five elements. There are three coins on the collar. This lion is used by schools with an established Sifu (teacher) or organization and is known Rui shih (Shui Shi) or The Auspicious Lion. The Guan Gong (Cantonese: Kwan Kung)lion has a red based face, black fur, with a long black beard (as he was also known as the "Duke with the Beautiful Beard"). The tail is red with black trim. He is known as the second brother and sports two coins on the collar. This Lion is known as Hsing Shih (Shing Shi) or the Awakened Lion. This lion is generally used by most. The Zhang Fei (Cantonese: Chang Fei) lion has a black based face with short black beard, culiflowered ears, and black fur. The tail is black with white trim. Traditionally this lion also had bells attached to the body, which served as a warning like a rattler on a rattle snake. Being the youngest of the three brothers, there is a single coin on the collar. 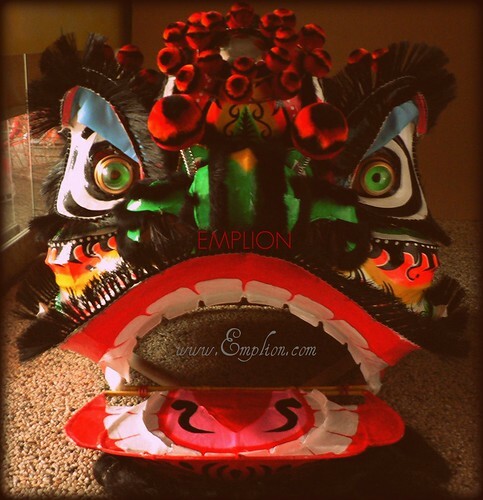 This Lion is known as the Fighting Lion because Zhang Fei had a quick temper and loved to fight. This lion is used by clubs that were just starting out. Later an additional three Lions were added to the group. 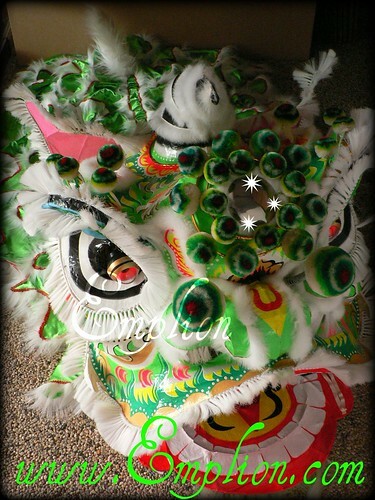 The Green faced lion represented Zhao Yun or Zhao (Cantonese: Chiu) Zi Long. He has a green tail with white beard and fur and an iron horn. He is often called the fourth brother, this lion is called the Heroic Lion because it is said he rode through Cao Cao’s million man army and rescued Liu Bei’s infant and fought his way back out. The Yellow (yellow/orange) face and body with white beard represented Huang Zhong(Cantonese: Wong Tsung) , we was given this color when Liu Bei rose to become Emperor. This lion is called the Righteous Lion. The white color lion is known as Ma Chao (Cantonese: Ma Chiu), he was assigned this color because he always wore a white arm band to battle against the Emperor of Wei, Cao Cao, to signify that he was in mourning for his father and brother who had been murdered by Cao Cao. Thus this lion was known as the funeral lion. This lion is never used except for a funeral for the Sifu or some important head of the group, and in such cases it is usually burned right after. Even if it is properly stored, it is not something one would want to keep, as it is symbolically inauspicious to have around. It is sometimes though, confused with the silver lion which sometimes has a white like coloring. These three along with Guan Yu and Zhang Fei were known as the “Five Tiger Generals of Shu,” each representing one of the colors of the five elements. 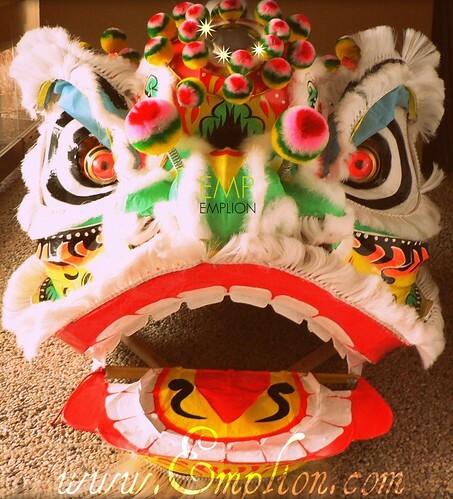 During the Chinese New Year, lion dancers from martial art school will visit the store front of businesses to "choi chang" (採青 lit. picking the greens). The business would tie a red envelope filled with money to a head of lettuce and hang it high above the front door. The lion will approach the lettuce like a curious cat, consume the lettuce and spit out the leaves but not the money. 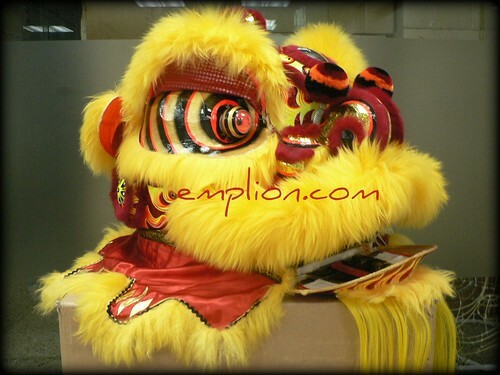 The lion dance is supposed to bring good luck and fortune to the business and the dancers receive the money as reward. The tradition becomes a mutual transaction. Other types of "greens" (青) may also be used to challenge the troupe, for instance using pineapples, pomelos, bananas, oranges, sugar cane shoots, earthen pots to create pseudo barriers and challenges. The dance also performed at other important occasions including Chinese festivals, business opening ceremonies and weddings.